Let's Draw Out Your Genius! Drawing on our strategy skills honed with the brands like IBM, Hanes and Unilever, we can help you spark new ideas, additional revenue streams and more excitement for your project. We can go to your office, an offsite retreat, or even conduct sessions online via livestream. Science tells us that visuals light up a whole other part of people’s brains. It also shows on their faces. With a live storyboard, plus digital shareable images, they won’t forget the talk, training or takeaways ten minutes after they leave. We bring branding expertise as well as visual storyteling to your organization, and can help you hone your message to become a rallying cry for your whole company. Together, we can map out your customer journey and the story of your brand, and share the vision with everyone. When everyone’s ideas and voices are captured and visualized, they go from being clock-punchers to stakeholders and even evangelists. Get your people off their smartphones and into the room contrbuting to your company’s success. Our pictures make surprising connections, spark creative problem-solving, and make ideas come to life. We use proven brainstorming techniques like SmartStorming(TM) to elicit the best thinking from everyone on your team. 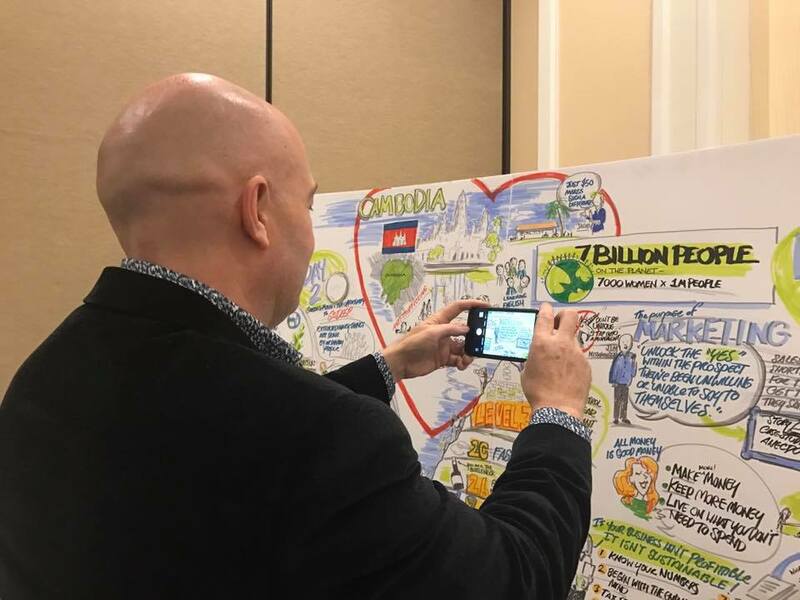 Having us storyboard your event, meeting or seminar not only gets people in the room engaged and remembering key takeaways, but sharing them with others. The board creates connections between ideas that help to make the information more meaningful and memorable, as well as shareable. It provides a touchpoint for discussion both in the event and well into the future. As an award-winning copywriter and associate creative director in the “Mad Men” world of ad agencies in NYC and Europe, Lisa Rothstein has been responsible for iconic and beloved brand messages for companies like IBM, Hanes, Unilever, Bacardi and many more, in over 17 countries. Adding in her talents as a cartoonist and ideator, she draws connections among ideas and creates clarity and collaboration our of chaos and confusion. With her on your team you will discover your most moving brand story, capture the brilliance of all your people and memorialize your best ideas to share across your entire company and beyond. Subject -- Subject --We need you to capture a seminar or eventWe need you to facilitate a brainstorming sessionWe need a visual map of a process or ideaSomething else~ Let's talk.